I grew up in Wisconsin, land of the cheese heads. I mean, who doesn’t love a good sharp cheddar on crackers, or cheese curds so fresh they squeak when you bite into them!? But really, Wisconsin took it to the next level sometimes. I mean, people spend $20 to wear foam cheese wedges on their heads at Green Bay Packers’ games. Of all the ridiculous NFL game day costumes, rituals, and souvenirs, the original cheesehead has to be one of the most recognizable, and one of the more ludicrous, things to catch on. That said, would I wear one? I mean…probably…yeah. As a kid there was usually at least Kraft singles in the house, and mac and cheese, grilled cheese sandwiches, and scrambled eggs topped with cheese were some of the first dishes I was allowed to cook for myself without supervision. My brother and I used to have a friendly kitchen competition over who could make the best “cheese melt,” a simple snack that involved melting two pieces of American cheese over a piece of white bread in the microwave. The trick was getting just the right level of meltiness, though for a while I went through a phase where I liked them burned, and overcooked them until the cheese turned brown and crusty. But while I’ve always enjoyed cheese, I didn’t pay much attention to what made cheese good, bad, or interesting until I was older. Then, sometime in college I came across a sample table in the grocery store offering cubes of smoked Gruyère, and my culinary cheese mind was blown. I bought a block for $6 (a splurge for a college kid who didn’t have a lot of spare cash) and judiciously began to ration it out. It’s funny how some things are just randomly attached to certain memories. The best thing I ever made with that cheese (though not the same block I had bought in college!) was a homemade pizza with smoked Gruyère, bacon, arugula, pesto, and garlic. I lived by myself at the time and didn’t finish the whole pizza for dinner, so saved leftovers for the next night. I then ended up sharing those leftovers unexpectedly the next evening with the guy I had met for a first date that afternoon, who happened to wind up back at my apartment around dinner time and was more than happy to eat my cold pizza leftovers. I’d end up marrying that guy. I’m not saying smoked Gruyère brought us together. I’m just saying that amazing block of cheese is in the background of the memory! Today, a good charcuterie board is, quite possibly, my favorite appetizer. Having expanded my cheese palette beyond my Wisconsin cheddar roots, I can appreciate not only an interesting cheese on its own, but also the interesting things it might do to the flavor of a wine, or how geography can affect your cheesy experience. For example, we all might appreciate a little sprinkle of parmesan on our spaghetti from time to time, but if you’re actually sitting in Italy, watching the fresh wheels of parmesan get hacked into slabs and freshly displayed in the deli counter, that appreciation becomes something of a cultural moment. While many can pick out cheddar, mozzarella, and Swiss in the grocery aisle without issue, fewer are likely to gravitate gouda, Gruyère, or harvati, and only a real cheese connoisseur would look at gjetost and know what to do with it! It’s time to expand your cheese horizons! Here are a few good places to start. Let’s start with a widely distributed, Wisconsin award winner. Bellavitano is a cow’s milk cheese modeled after Italian farm cheese…like a parmesan, but not a parmesan! Bellavitano is most interesting because of the various rubs and rinds you can purchase it with. Varieties like: black pepper, merlot, raspberry, espresso, citrus ginger, and balsamic all add something a little bit different to the snacking experience. Try the black pepper on crackers with a nice fatty sausage, the espresso with a glass of red wine, and the citrus ginger crumbled over a fresh spinach salad. A staple of our dinner party appetizer course, you also can’t go wrong with Bellavitano Gold, the award winning original free of added rubs or seasoning. Sometimes things are named for exactly what they are. 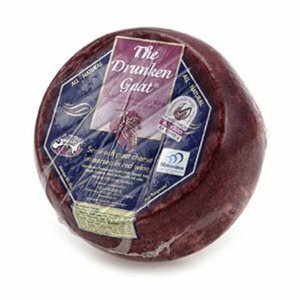 A semi-soft goat cheese soaked in Spanish red wine for 72 hours, drunken goat cheese has a deep purple edge and a rich white center. If you think you don’t like goat cheese, it could be because you’ve only ever been exposed to the sharp, spreadable, fresh goat cheese that people smear over crackers or drop into tangy lumps on salad. Aged goat cheese has a much more mild flavor and is much closer to a soft white cheese like you might slice for sandwiches. Try drunken goat cheese with a glass of cabernet and other Spanish favorites like almonds, olives, and spicy chorizo. Halloumi was originally made from sheep’s milk on the Greek island of Cyprus. Though today you can find it much more widely distributed and offered from many stateside creameries, it’s technically only the Greek made cheese that’s allowed to be called Halloumi (like real champagne only coming from Champagne, France!). You may also find it call “Halloumi-style” or “grillable cheese.” All are members of the same cheese family! Halloumi is meant to be warmed or grilled before served. Cold, it’s a bit salty and rubbery, but warmed, that saltiness mellows into a savory bite, offset by a nice caramelization and slight crunchiness from the browned edged when grilled. Slice it thin and pan “fry” it over medium heat being careful not to let it burn. Then serve it which toasted baguette or freshly sliced tomatoes. Or, if you’re feeling particularly adventurous, serve warm with chilled watermelon like they do in Cyprus! 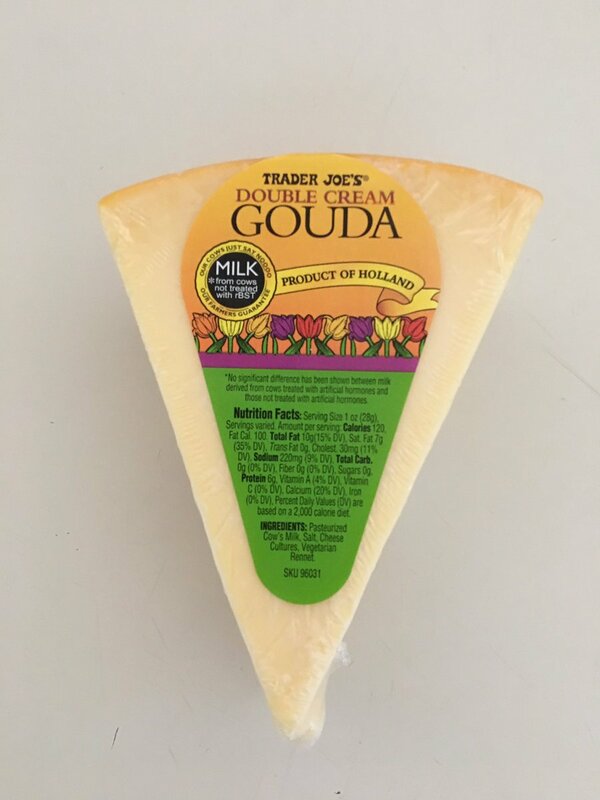 This double cream gouda is not particularly interesting as far as offering something that other gouda’s don’t flavor-wise, but the texture is exceptionally creamy (given the double cream) and it’s best feature is the meltiness. If you want an awesome option for your grilled cheese sandwiches…this is it! If you want an awesome option for your homemade mac and cheeses…this is it! If you want an awesome option for your queso or fondu…this is it! It’s lacking saltiness, which I like in a cheese, so be prepared to season you dishes, or try it with a zesty pesto on flatbread crackers or spicy salami. In the heart of winter, when comfort food speaks straight to the heart and Super Bowl snack spreads are about to abound, consider getting creatively cheesy and venture away from the old standbys. Pour the wine and say cheese! Next Ladies, stop crushing on fictional sociopaths!